There are certain things in life that for obvious reasons, we shouldn’t eat— things like human flesh, cats, and my meatloaf. There then are other things that look and smell good enough to eat but aren’t, like apple pie candles, passion fruit deodorant, and my meatloaf. Until recently, I would have added flowers to that list. But thanks to my friend Beth who mentioned she recently prepared stuffed squash blossoms for dinner, I discovered the edibility of the beautiful, bright orange squash blossom. Although I didn’t even know what squash blossoms were, I was intrigued. One, because I had never eaten a flower not made of icing, and two, because stuffing squash blossoms sounded healthier for dinner than stuffing hot dogs into buns. “What are squash blossoms, anyway?” I asked Beth. She cocked her head slightly and looked at me as though I had just asked her the color of Napoleon’s white horse. “Squash blossoms are the blossoms of squash,” she answered with a trace of “really?” in her voice. Call me naïve, but since when were squash blossoms considered a common menu item? Have you ever ordered a steak with a side of sautéed squash blossoms, or cruised down the frozen food aisle and observed Green Giant “squash blossom vegetable medley” on the shelf? Beth went on to explain that squash blossoms are the flowers of any summer squash, and can be purchased at farmer’s markets and specialty stores. “You should try them,” she encouraged. I was skeptical. Flowers for dinner? What would I serve them with—a clod of dirt? I was equally intimidated by the idea of cooking a flower. The only flower I had worked with was spelled differently and used mostly for baking. On the other hand, I was allured by the idea of preparing an exotic dish that didn’t have Hebrew National in the title. I would not let fear get the better of me. I would embrace my spirit of adventure. I would take the bull by the horns. 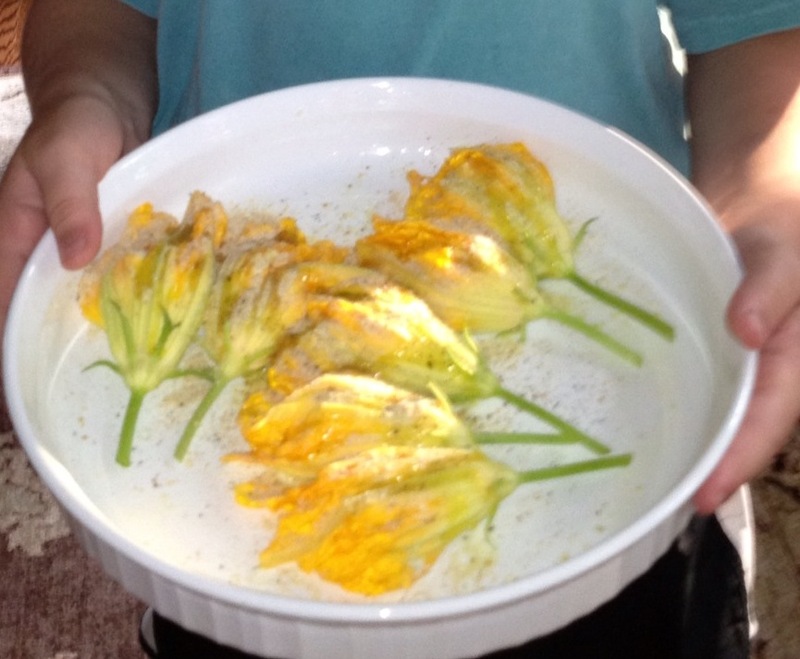 I would ask my husband Chris to prepare the squash blossoms. He was up for the challenge. What’s more, he informed me, we had squash blossoms growing right in our very own vegetable garden. “Right in our garden! Wow, how did I not know that?” I asked. “No, I wasn’t saying anything, I just . . .
“I’ll pick the squash blossoms,” I said. Without further delay, I strolled out to the garden and entered the thicket of tangled squash vines. I squatted down to admire the beautiful trumpet-like flowers with long, graceful necks. Then I reached out to pick one. That’s when I felt a fiery pain radiate through my fingers. “What the . . .” I snatched my hand back from what felt like a desert cactus. Upon closer examination, I noticed tiny needles covering the squash stem. That damn squash was as prickly as a Tom Cruise divorce. I ran back to the garage for gardening gloves. Armed with proper gear, I picked an armful of blossoms and brought them into the kitchen for Chris. He set to task on Beth’s recipe, stuffing the delicate flowers with a ricotta cheese mixture while I made the more complicated part of the meal, canned chili. Chris baked the blossoms and served them with a garnish of fresh herbs. The stuffed blossoms looked exquisite and tasted delicious. If you’re looking to embrace your culinary spirit of adventure, consider squash blossoms. Gathering them may be a thorny job, but it won’t kill you to try them. Once you’ve treated your flesh wounds, clean blossoms by gently rinsing them with water. Mix 16 oz whole milk ricotta cheese with 1 egg, 1 clove minced garlic, 1 tbs fresh parsley and salt and pepper to taste (remember: salt in wounds hurts really bad). Stuff the blossoms with a spoonful of filling. Place in greased baking dish in preheated oven and bake at 350 for twenty minutes. Garnish with a sprig of parsley, curled carrots, or a rack of ribs. Looks delightful. I usually add a little parmagian to my ricotta for a little extra bite to flavor. In this case I would add sugar and/or use farmer’s cheese as looks like nice dessert cold as well. I’ll have to try that. Looks like I’ll pay the squash patch another visit—-but not without gloves. My garden has a couple of pine cones on a pine tree. Can you suggest any good recipes ? We used to make these a lot when my girls were trying to grow a huge pumpkin…you have to pick off all the blossoms, so all the energy will go to the one pumpkin. Maybe that explains our zucchini that’s grown bigger than a poodle. Fun post. I’ve never had, or attempted to make squash blossoms. I’m more curious as to what’s up with your meatloaf, girl! I’m afraid I cannot reveal my meatloaf recipe because it’s my secret weapon. Literally. But make for a painful exit . . .
You are a culinary adventurer. I’ve never eaten squash blossoms, but now I’m intrigued. Have you considered writing a humor cookbook?. Anyone can collect and publish recipes, but yours had that added dose of humor which always makes a dish tasty. Why thank you, Paprika. How about a joint venture? Wouldn’t that be a hoot? Food for thought . . .
That would be a hoot! We should definitely consider it. Who knew?! Thanks, I’ll pass that on to farmer Chris! Is there ANYTHING that Chris can’t do?! Wish I would have planted some squash. However, any attempt at gardening would put me at risk for melting. Well, he can’t find a wife who has a green thumb . . .
Krista I could imagine you really enjoying having a garden. Maybe you could plant some fall/winter veggies so you don’t risk melting?! Shoot, I’d have your meatloaf before eating flowers. No, seriously!! Oh, but it LOOKS great. You sound like a meat and potatoes kind of guy. I’m a carnivore too, but I’ll try anything once (within reason). And In-N-Out burgers! Oh, how the California girl in me misses them. Squash plants are very scratchy indeed (but not as much as painful berry bushes). I’ve never tried squash blossoms when I’ve grown squash, simply because I figure I can get a few more calories out of my garden by letting the blossoms turn into squash. But the damn squirrels seem to enjoy any squash and melon blossom that I grow, so they know what’s good. Sounds like you need to get rid of those pesky squirrels. Maybe I should send you my meatloaf recipe . . .
“Serve them up with a side of ribs,”…priceless. You seem to have a lot of costumes or protective wear at your home. What’s up with that? I use it to hide from the paparazzi. Sounds like a yummy recipe. I think we’ll have to give it a go! If your squash is as prolific as your potatoes you’ll be doing a lot of stuffing! they’re good stuffed with mozarella, breaded and fried. Just tried some this summer! What isn’t good stuffed with mozzarella, breaded and fried? Your descriptions and humor are a delightful main course. The squash flowers – a tempting side dish. I have eaten flowers before. They were part of a meal in a fancy restaurant, and they were very tasty. Your recipe sounds yummy, too. I will add it to my recipe file. And your sweet comment was a lovely dessert! Yeah, I’m probably kinda not going to be cooking that one anytime soon. I just have an aversion to hummingbird poop. Well when you put it that way . . .
I’ve heard very good things about stuffed squash blossoms. I’m think’in I might try them out to avoid the puncture wounds. It’s important to practice safe squash. Hi there, I’m a first timer here… Loved reading about your maiden voyage out into the wilds of the garden and thanks for sharing all of the great links! One thing you didn’t mention, is that usually the male blossoms are used for stuffing, making fritters, whatever. Male flowers come on the plant first (go figure; ) and grow on long thin stems (which may even have less “prickles”; ). You can tell the females apart by looking for the smooth, tiny bulge of developing fruit at the base. It sounds like the “Men are From Mars, Women are From Venus” of squash! Unless you only want one monster, prize winning zuke to enter in the fair, keep picking when they’re young and tender (6-10 inches?). As a lot of plants do, once they’ve grown seed, they’ll stop producing fruit – particularly in a hot, dry year like this one. Thanks so much for the great info, Deb. I really appreciate it (and I know my husband will too)! love this… I can totally see eating these. On a dare, with friends and lots o’wine.